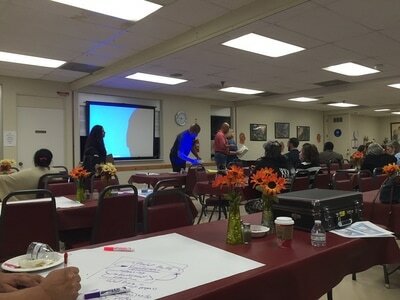 ​El Cajon Collaborative partnered with Newcomer Support & Development to provide residents an opportunity to share their concerns and challenges in their communities and provide ideas and suggestions for solutions. 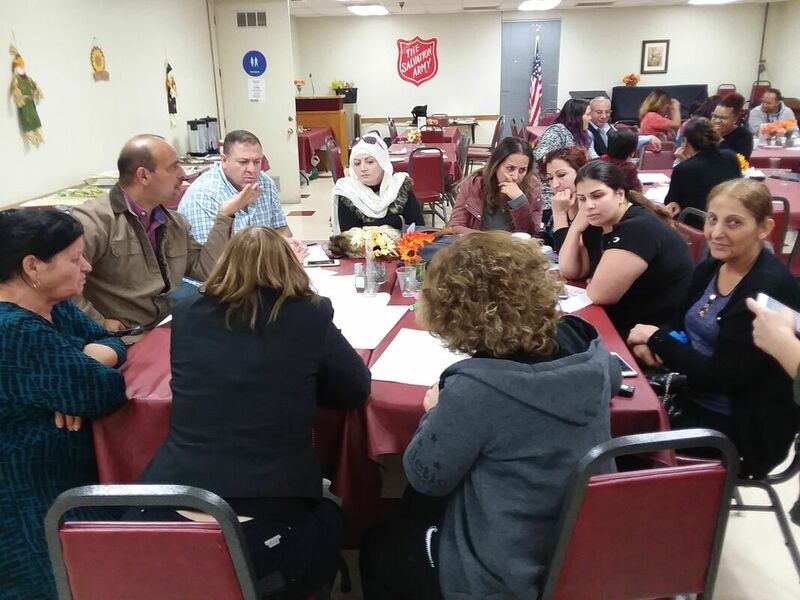 The forum was held in English, Spanish and Arabic so that all community members could contribute and share. There were nearly 50 families that attended and childcare was provided. Thank you to Arboreta Group for the opportunity to host the event and Salvation Army for providing the venue. 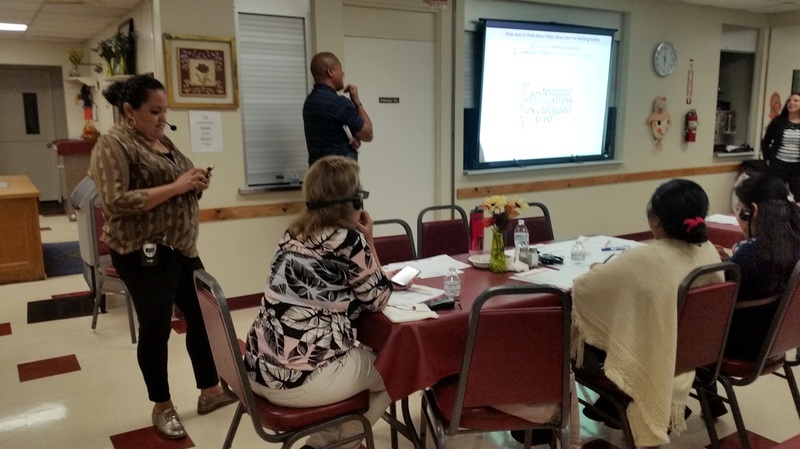 The results will be shared in the 2018 Community Action Partnership Needs Assessment. 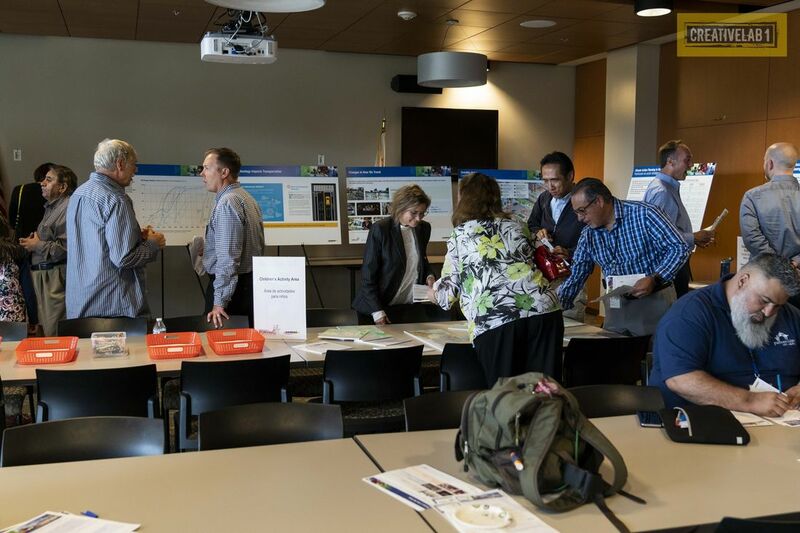 Throughout the month of October, El Cajon Collaborative reached out to community groups to complete a survey for the 2019 Regional Plan. 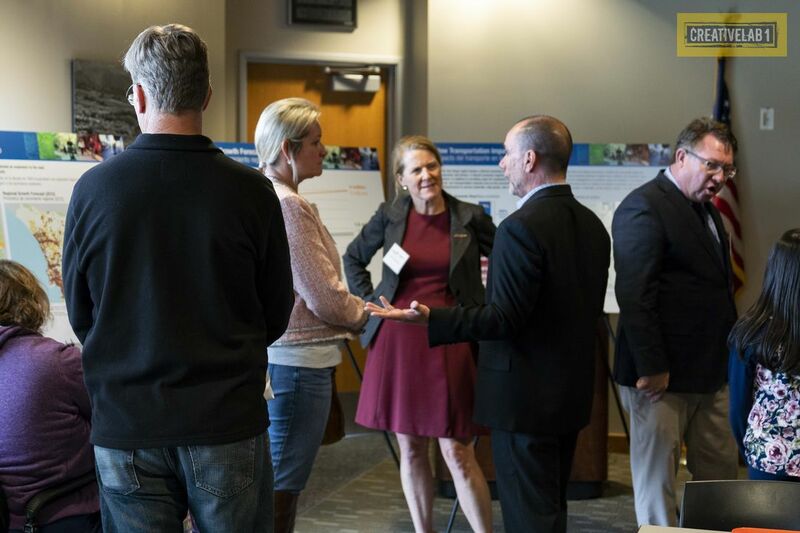 Three network scenarios were presented to residents to share their preferences for projects and programs that should be the focus of the Plan when it is completed in 2019. 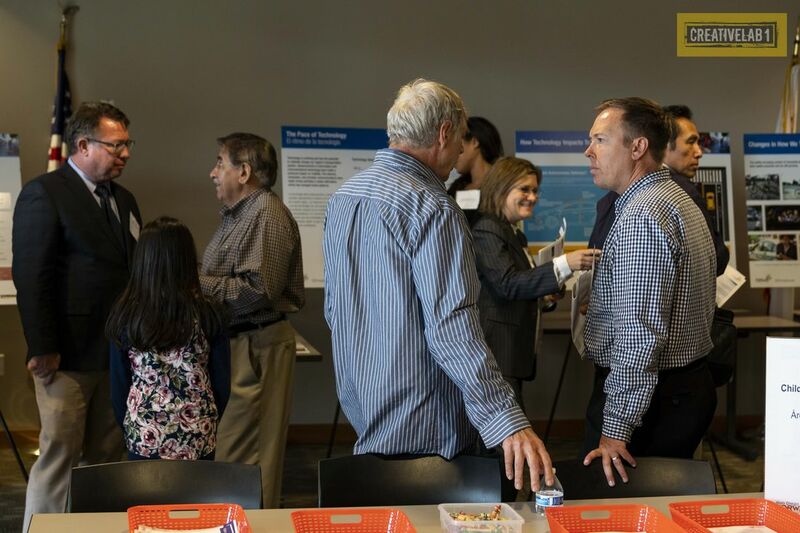 The feedback from the community will be combined with the SANDAG Board of Directors suggestions, and a final network scenario will be completed in December 2019. The final network scenario will go back out to the community for public comment. 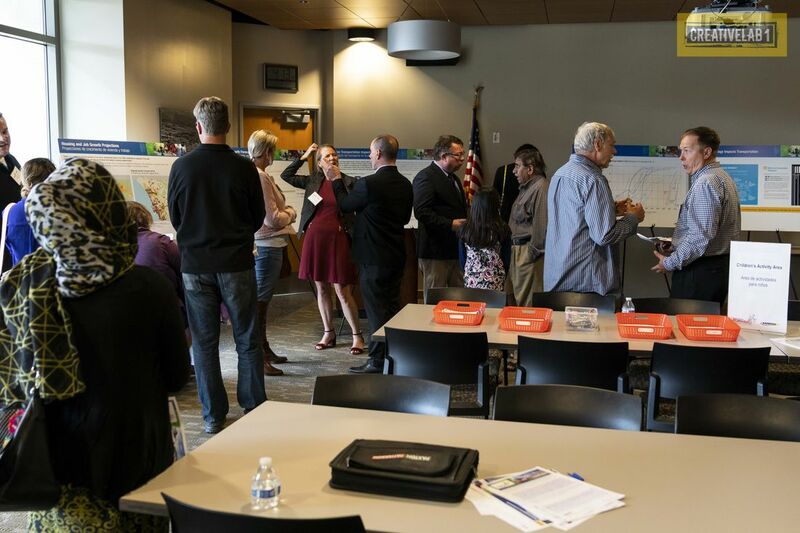 Once the scenario is approved, it will be used to draft the final 2019 Regional Plan. Most everyone enjoyed the opportunity to use the mobile-friendly online interactive survey. For those who were more comfortable, paper surveys were provided in several languages. 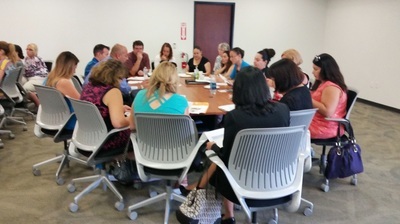 Live Well San Diego--"Shout out to our #LiveWellSD Recognized Partner, El Cajon Collaborative! The El Cajon Collaborative builds relationships, leverages resources and promotes best practices to enhance the quality of life for children, youth and families in their community." Thank you for the Proclamation HHSA and the SD County Board of Supervisors. We appreciate the recognition! Way to go, ECC Partners! 2018. 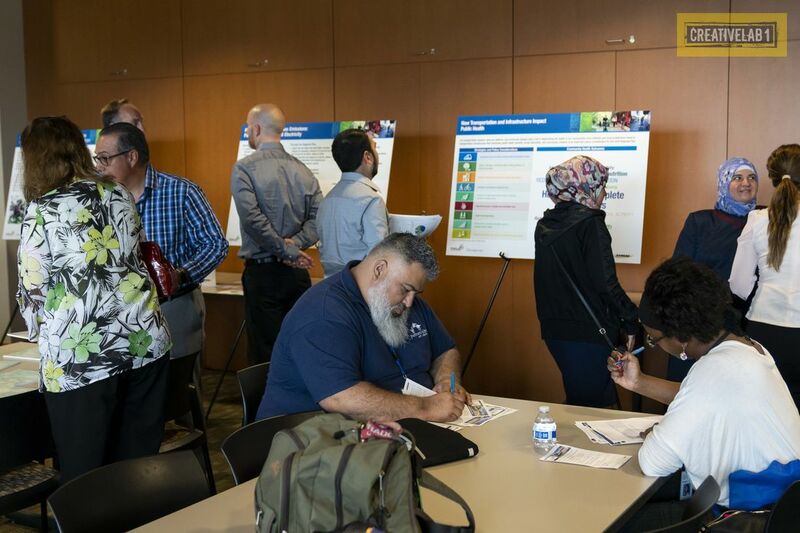 THANK YOU TO ALL OF THOSE WHO PARTICIPATED IN SHARING THEIR INPUT ON FACTORS TO CONSIDER AS SANDAG DEVELOPS THE 2019 REGIONAL PLAN. 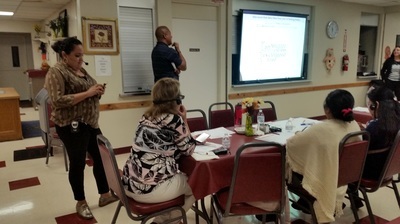 CITY STAFF, PLANNERS AND COMMUNITY MEMBERS GATHERED TO LEARN ABOUT THE REGIONAL TRANSPORTATION PLAN INCLUDING OPTIONS FOR PROJECTS, TECHNOLOGY AND PROGRAMS TO ASSIST LOW-INCOME, SENIORS AND PERSONS WITH DISABILITIES TO ENSURE SOCIAL EQUITY. It was a lively conversation at the Salvation Army, on Tuesday, November 15th. 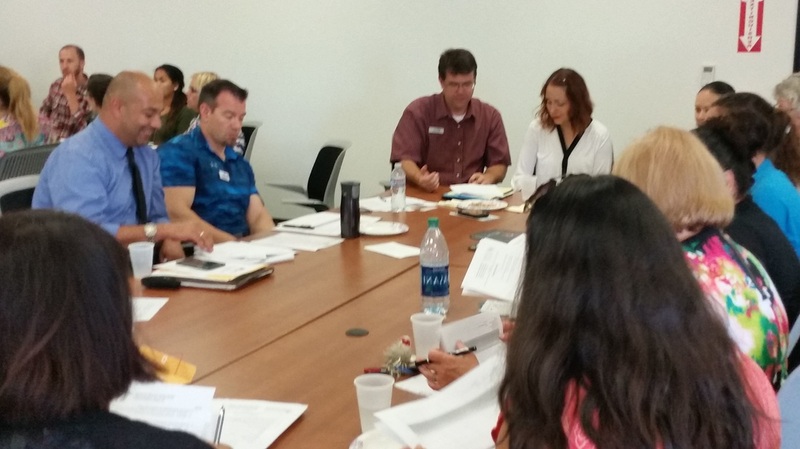 In 2014, El Cajon Collaborative partnered with CHIP Resident Leadership Academy and HHSA-East Region to assess the needs in our community. Some of the issues that were identified were Education, Employment, Housing, Community Engagement, Access to Healthy Food Options, Youth Programs, Infrastructure, Transportation and Anti-Gang Programs. 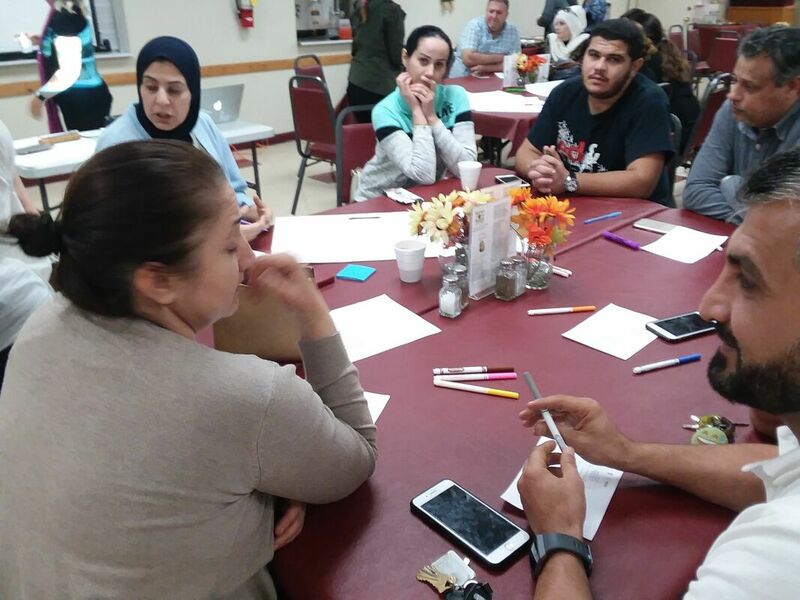 On Tuesday, the community was asked to do a survey by phone or paper, to prioritize the challenges and also identify new challenges that exist. 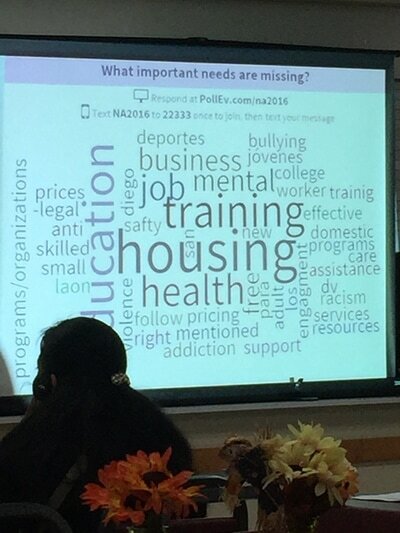 Some of the topics below were also recognized. Translation services were offered to our Arabic and Spanish speaking residents. It was a lot of fun while working with each other to start the conversation about solutions. 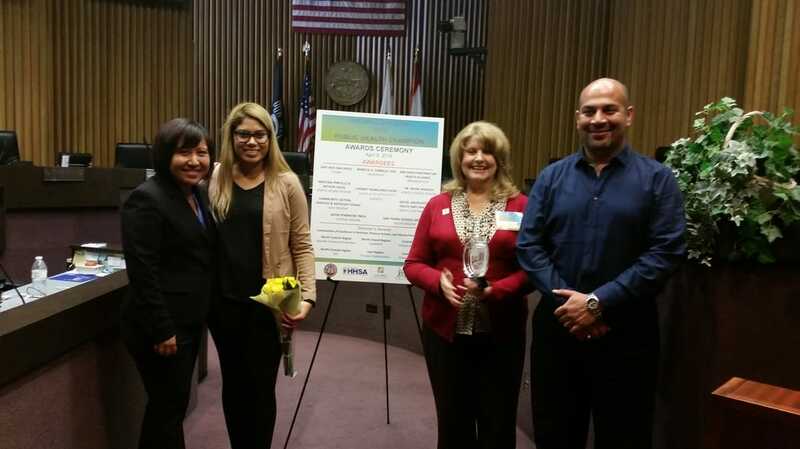 ​HEALTH AND HUMAN SERVICES AND THE SAN DIEGO COUNTY BOARD OF SUPERVISORS RECOGNIZED LOCAL ORGANIZATIONS AND INDIVIDUALS WITH PUBLIC HEALTH CHAMPION AWARDS ON APRIL 8TH IN THE COUNTY SUPERVISORS BOARD ROOM. CONGRATULATIONS GO TO CASA FOR SAFE AND HEALTHY NEIGHBORHOODS, A LOCAL ADVOCACY ORGANIZATION THAT HAS BEEN SERVING SAN DIEGO COUNTY FOR MORE THAN 30 YEARS. 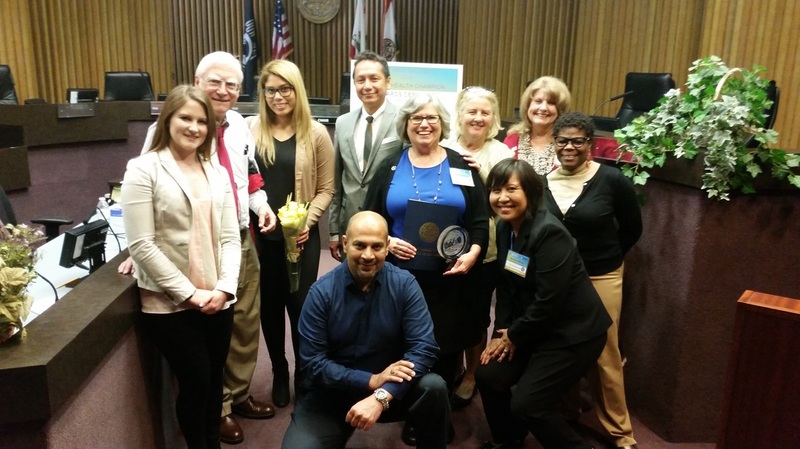 EXECUTIVE DIRECTOR DANA STEVENS AND HER STAFF WERE RECOGNIZED AS THE EAST COUNTY ORGANIZATION AWARD. EL CAJON COLLABORATIVE WAS AWARDED THE DIRECTORS AWARD FOR THE COMMUNITIES OF EXCELLENCE PROJECT (CX3), SHARING THE AWARD WITH OTHER SAN DIEGO ORGANIZATIONS THAT HAVE HELPED BRING FORWARD IMPROVED ACCESS TO HEALTHY FOOD, PHYSICAL ACTIVITY AND REDUCTION OF OBESITY. THIS HAS BEEN A MULTI-YEAR PROJECT THAT HAS SHOWN RESULTS THROUGH EDUCATION, POLICY CHANGE, ASSESSMENTS AND ADVOCACY. 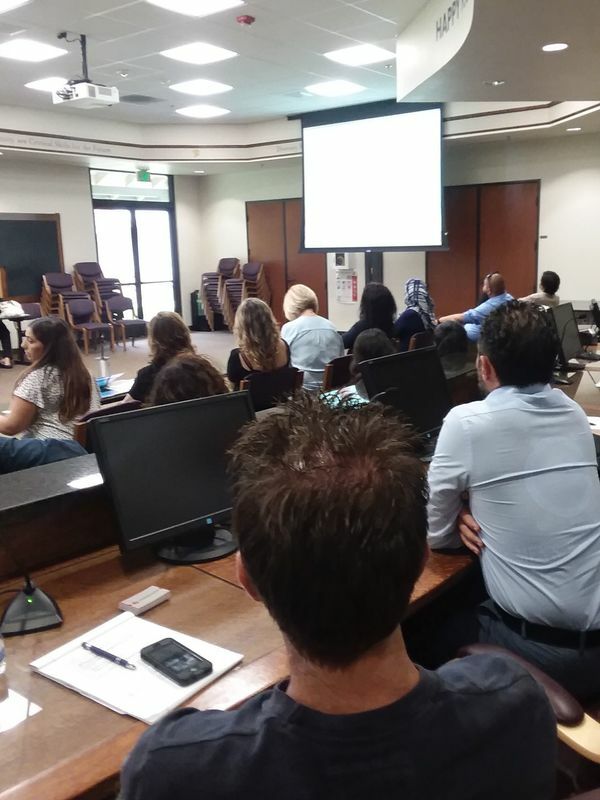 The El Cajon Resource Website has been a valuable tool for families looking for local resources that are convenient and affordable. Transportation is often a barrier so locating services close to home is very important. 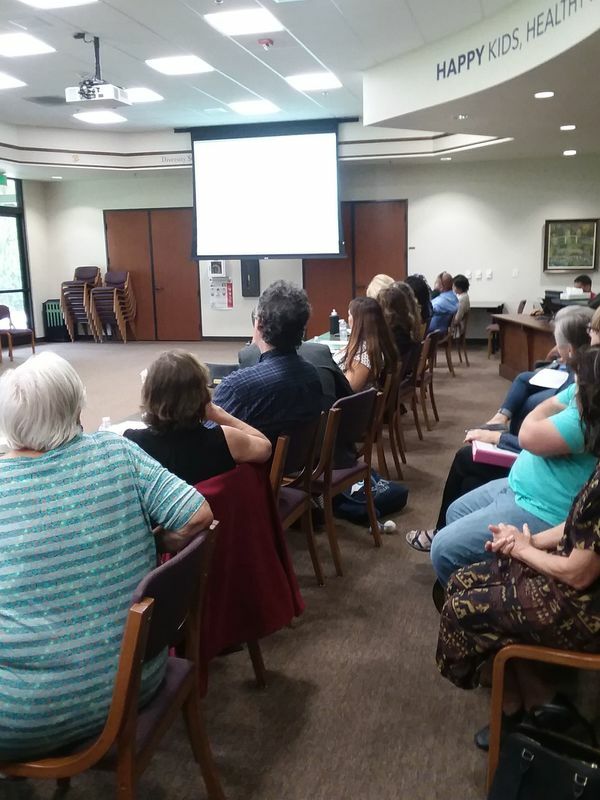 A recent evaluation of the El Cajon Resource Website has shown how it is being used and by whom. The number one search need was access to food. Many of our families are living on a limited budget, and funds to purchase food often run out before the end of the month. The study showed that most searches for food access occurred the week before payday for most individuals. 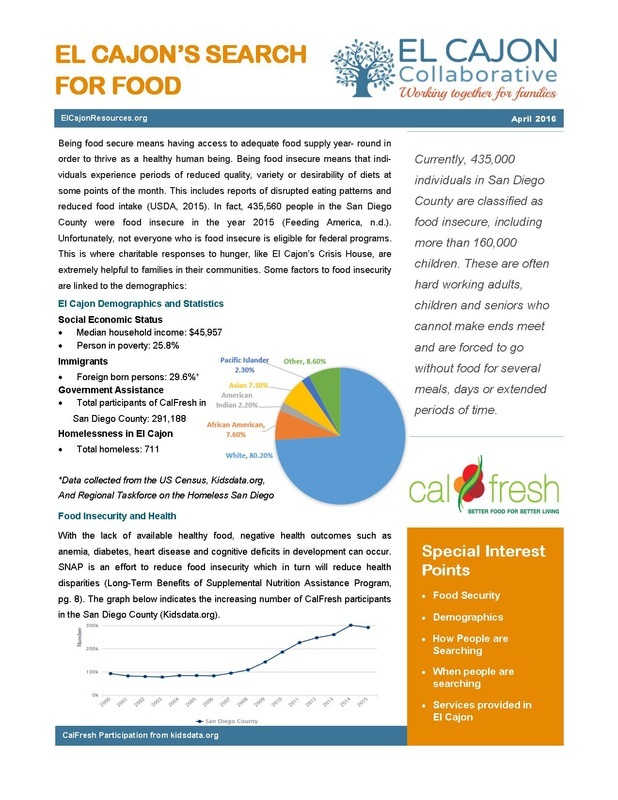 The Food Resources page provides links to local food pantries, summer lunch programs, CalFresh application assistance and nutrition classes. This resource to food is proving to be useful, as 77% of the sessions are new users and 23% of users have continued to refer back to this specific page. 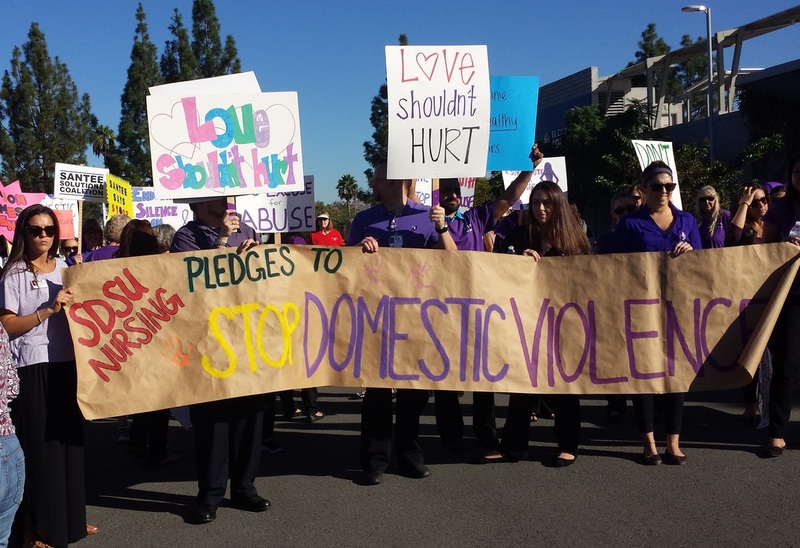 (Over one hundred people turned out on Friday to rally in support of our domestic violence survivors and to honor those we have lost. The rally began at the El Cajon Police Department and headed east on Main Street to the Prescott Promenade. Car horns honked in support of the walkers as they displayed their signs to "Stop the Hate and Stop the Violence." At the Promenade three survivors shared their stories as supporters hugged and cried. They were stories of abuse, hurt, and fear. But they were also stories of finding the strength to rise up against their abusers and to live full, thriving lives beyond the abuse. It was very moving and inspiring. Senator Anderson's office had representatives on hand to thank the agencies who support the survivors of domestic violence. There were also resource tables available with information of support groups and services for those in violent situations.